Obituaries today are, for the most part, very skeletal. This seems a shame, considering the opportunity confessional Lutherans have to let their light shine in the writing of obituaries – not only to express the sure hope of eternal life in the face of death, but also to share moments from the Christian life that make the Christian faith supremely attractive. In the process of some historical research, I came across this breathtaking obituary of Andreas Schroedel (1851-1909). It comes from the Ev.-Luth. Gemeinde-Blatt [Evangelical Lutheran Church Paper], vol. 44, no. 24 (15 Dec 1909), p. 370,371. Rev. Schroedel concluded his ministry as pastor of Trinity Lutheran Church in downtown St. Paul, Minnesota (which has since merged with one of its daughter congregations to become Crown of Life in West St. Paul), and as president of the Minnesota Synod (back when the Wisconsin Synod was a federation of smaller state synods). 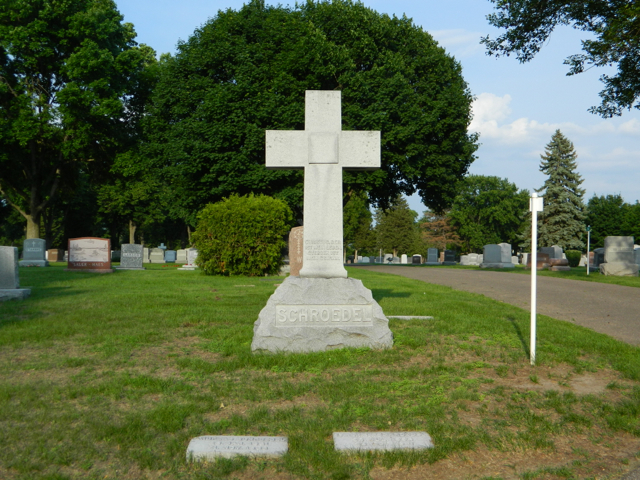 He is buried in Elmhurst Cemetery, St. Paul. As you can see, the story of Schroedel’s life also gives us a glimpse into the heart of the founding president of the Wisconsin Synod, Johannes Muehlhaeuser. The Lord has paid us a difficult visit and has suddenly put us into a state of profound grief. On the last Sunday in the church year, November 21, 1909, he called Andreas Schroedel, our dear president, out of this earthly life. The funeral took place on Wednesday, November 24, in St. Paul, Minnesota. Around 10 a.m. a brief service was held at his home for his relatives. A number of pastors and professors were also present for this service. Pastor C. J. Albrecht comforted the bereaved using the words of 1 Thessalonians 4:17,18. Around 11 o’clock the coffin was carried by the elders to Trinity Church, where it was put on the bier in order to give the members of the church and the many friends an opportunity to look one last time on their pastor and friend who had fallen asleep. In keeping with the family’s wishes, members of the Board of Elders served as the honor guard1 from 11:00-1:30, and Pastors Schrader, Haase, Emmel, and Schulze from 1:30-2:00. During those three hours a continuous string of dear friends, young and old, passed by the coffin, while the organist played soothing selections. Around 2 o’clock the relatives were ushered into the church, and the service began with a congregational hymn (no. 624).2 The director [chairman] of the congregation, A. Ackermann, spoke the prayer at the altar and read Psalm 90. By special request of the grieving widow, Pastor J. Plocher delivered the German sermon. He chose Hebrews 13:7 as his text. Vice President A. F. Zich preached the English sermon on Luke 12:42-44. The undersigned read the biographical sketch of the deceased. The church choir and Concordia College’s student choir sang funeral songs. Particularly moving was the singing of the dear old song, “Laßt mich geh’n [Let Me Go],” by the schoolchildren. Brief addresses were also delivered by President F. Soll, representing our joint synod and joint institutions; President G. E. Bergemann, representing the Wisconsin Synod and Northwestern University; President Theo. Braeuer, representing the Nebraska Synod; Vice President F. Pfotenhauer, representing the Joint Synod of Missouri; Dr. H. G. Stub, representing the Norwegian Synod; and Pastor P. Kreinheder, representing the English Missouri Synod. Director [President] J. Schaller from the seminary in Wauwatosa, Dr. J. H. Ott from Northwestern University in Watertown, almost the entire faculty from New Ulm, and many other pastors and professors from both our synod and the Missouri Synod were in attendance. All were deeply moved and the eyes of many were filled with tears when the shepherd was carried out of the church who had faithfully tended his congregation for 16 years and had on so many occasions unselfishly served us, his brothers, by counsel and action. By 5 o’clock the observance in the church was ended and the long funeral procession went slowly with the mortal frame of the dear deceased to the cemetery. There Pastor A. F. Winter officiated. It was already dark when the large number of mourners came from the grave, deeply grieved, yet comforted, for “blessed are the dead who die in the Lord from now on” [Rev 14:13]. President Schroedel was born on January 29, 1851, in Neustadtren [sic], Kulm[bach], in Bavaria, the youngest child of the master weaver Johann Schroedel and his wife Katharina (née Denderlein). In Holy Baptism he received the name Andreas. In 1853 his parents emigrated to America and established their home in Milwaukee, Wisconsin. There they became members of Grace Church and were under the spiritual care of Pastor Muehlhaeuser. The young Andreas received his schooling and confirmation instruction in this church and was confirmed by Pastor Muehlhaeuser in 1864. After his confirmation he would gladly have enrolled at once in our school of the prophets in Watertown in order to prepare himself for the holy preaching ministry, except that this ardent wish, which was both his own and his pious mother’s, had to remain just a wish at first, since his parents were lacking the necessary financial means for such schooling. For a considerable time, therefore, Andreas Schroedel helped his parents as he was able in the acquisition of their daily bread. But Pastor Muehlhaeuser, who had become fond of the pious and gifted boy and had in his confirmation instruction recognized the glorious gifts that God had given him, felt sorry that such an instrument should continue to be withheld from the holy preaching ministry. Accordingly Pastor Muehlhaeuser, by God’s grace, sought and found means and ways that Andreas Schroedel could enroll at Northwestern University in Watertown, Wisconsin, in spite of his circumstances. He faithfully made the most of his time there, and in 1873 passed his examination and received his certificate of maturity. In the fall of the same year he enrolled at the seminary in St. Louis, Missouri. He studied theology there for three years and in 1876 received his certification for the holy preaching ministry from the Concordia Seminary faculty. The young candidate was first a pastor of the church in Naugart, Marathon County, Wisconsin. After he had served this congregation for five years, he followed a call to the church in Ridgeville, Wisconsin, in 1881. While serving there, he also served St. James Church in Norwalk and, until the fall of 1884, the church in Tomah, Wisconsin. 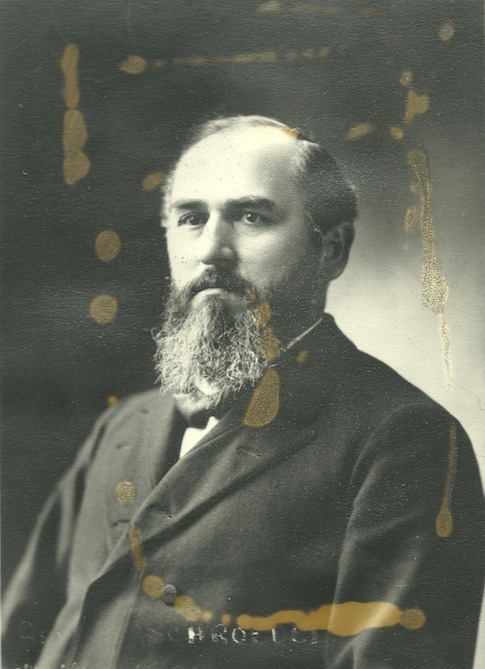 In 1889 Pastor Schroedel was issued the call: “The Lord requires your services at the institution in Watertown.” From September of 1889 to June of 1893 he served his alma mater, Northwestern University in Watertown, Wisconsin, as a professor. From Watertown the Lord sent him to Trinity Church in St. Paul, where he has continuously been a faithful and conscientious caretaker of souls and served unselfishly since the 11th Sunday after Trinity, 1893. For years he has also served our joint synod as a member of various boards, as he was able, and our dear Minnesota Synod will certainly not forget him. Ever since he came to our synod, he has carried its welfare on a praying heart and sought to promote its welfare as best he could. For the past three years he has been our president, and he has discharged the duties of this difficult and highly responsible office with selflessness and devotion, both in general and in particulars. Yes, we recognize that in our dear President Schroedel we have lost a simple but faithful father and brother. In the first year of his ministry, Pastor Schroedel joined Anna Bluehr in holy matrimony. After a short time God took his wife from him through death. On May 8, 1881, he married widow Emma Hoops (née Franke). With fortune and blessing he was permitted to live in this marriage until the end of his life. Three years ago they were able to celebrate their silver wedding anniversary and to thank God for his blessing and protection. The Schroedel family plot in Elmhurst cemetery. Andreas’ gravestone is in the foreground on the left. The carving on the bottom of the cross itself reads, “Christus, der ist mein Leben, Sterben ist mein Gewinn” (“For me to live is Jesus, To die is gain for me”). Shortly before his death, after his wife had also prayed with him the Lord’s Prayer and the final two stanzas of no. 164: “My Savior, then be near me,” etc.,4 he took leave of his love for this life forever, squeezed her hand once more and said, “Don’t cry that I am departing from you. You have someone with you who cares for you better than I and who is always with you.” Weary and faint, he lay back down on the pillow, drew a few more deep breaths, and fell asleep gently and peacefully – it was just after 5 o’clock on Sunday afternoon – and entered into the rest of the people of God. The next of kin who survive him are his wife, his sons Otto (in Omaha, Nebraska), Theophil (currently a student at the University of Berlin), his daughter Lydia, and a sister. He brought the duration of his earthly pilgrimage to 58 years, 9 months, and 23 days. — For 33 of those years he continuously served the church of Jesus Christ as a preacher of the gospel. May his memory remain with us in blessing! “Remember your teachers who have spoken the word of God to you; contemplate their end and imitate their faith” (Hebrews 13:7). 1 Today this practice is generally only found at a military funeral. But it appears to have been customary back then also at the funeral of any important personage. 2 “Ich hab’ mich Gott ergeben,” by J. Siegfried (1564-1637), an untranslated hymn sung to the same tune as “O Sacred Head, Now Wounded” (Christian Worship 105).